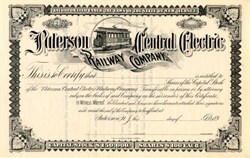 Beautifully engraved unissued certificate from the Paterson Central Electric Railway Company printed in 1892. This historic document was printed by Huber & Walter and has an ornate border around it with a vignette of an electric railway car. This item is over 118 years old. We have only seen a couple of these certificates, and believe they are quite scarce. The Paterson Central Electric Railway was incorporated 1892 as the consolidation of the Paterson Central Railway Co. and Central Electric Railway Co.